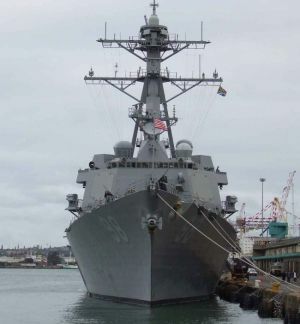 The US destroyer USS FORREST SHERMAN (DDG98) arrived in Durban yesterday morning on the South African section of the ship’s journey of circumnavigating Africa in a clockwise direction - down the east coast of the continent and returning to the Mediterranean via West Africa. The Arleigh Burke-class destroyer, which is the latest ship to be deployed by the US Navy, is under the command of Commander Dean Vesely and carries a crew of 315 officers and enlisted ‘men’ (including a number of women serving on board the ship). Together with the Ticonderoga class cruiser USS NORMANDY, the ship forms the newly established Southeast Africa Task Group, which has the goal of building strong partnerships with southeast African nations and promoting maritime safety and security initiatives. USS Forrest Sherman will sail from Durban this morning together with the South African Navy frigate SAS AMATOLA, which arrived in port at the weekend. At sea the two ships will link up with one of the South African Navy submarines and will participate in joint exercises en route to Cape Town. Also taking part in the exercise are several aircraft, including a US P3 ‘Orion’ and a SAAF C47 reconnaissance aircraft, as well as the two helicopters carried by the USS Forrest Sherman. The US and South African surface ships will be exchanging six crew members for the at-sea part of the exercise. The Commodore of the Southeast Africa Task Group 6.5, Captain Nicholas H Holman said at a reception on board the American vessel last night that it was hoped that further visits to the region would follow from next year. In addition to his command of Southeast Africa Task Group 60.5, Capt Holman is also Commander, Task Force 63/Commander, Sealift Logistics Command Europe, based in Italy. Sealift Logistics Command Europe is responsible for the pre-positioning and supply ships that have become regular callers at South African ports in recent years. From Cape Town the US ship will depart for West Africa where it is thought that further exercises in the Gulf of Guinea region are likely. In the past year the US military has embarked on training exercises with several West African countries in the region with the aim at bolstering regional security.